In modern and forward-thinking organisations, knowledge sharing is crucially important. It improves productivity, reduces risks, helps with staff retention, and more. What are the practical steps to create a knowledge sharing culture, and where does e-learning fit it in? E-learning fits into the second strand. Before going further, however, what are the advantages of knowledge sharing to your organisation. Fosters a learning culture – you benefit when employees actively participate in ongoing professional development. Internal knowledge sharing helps make learning a normal part of the working day. Reduces risks associated with knowledge loss or unavailability – individuals hoarding knowledge or having knowledge silos presents significant risks to your business. What would happen, for example, if an employee quits resulting in lost critical knowledge about your business, products, or services? Encourages a more supportive working environment – knowledge sharing also promotes teamwork and enhances peer-to-peer support. Enhances skills – the individual skill levels of the people on your team will improve, raising standards across your organisation. Fills knowledge gaps – knowledge sharing can also fill knowledge gaps that traditional training often misses. Examples include adopting best practices, problem-solving in particular situations, and more. Encourages creativity and innovation – knowledge sharing gives your team the skills and knowledge they need to be more creative and innovative, plus it helps create an environment where creativity and innovation are welcomed and promoted. Improves productivity – with enhanced knowledge, your employees will become more efficient and productive. Before any knowledge sharing initiative can work, you must get buy-in and then encourage participation. Buy in involves telling your team why knowledge sharing is important, how it will benefit the business, and how it will benefit them individually. One area you may have to overcome is knowledge hoarding. This is where an employee is over-protective of the knowledge they have as they feel it gives them a level of job, financial, or positional security. Knowledge hoarding can also occur for egotistical reasons. Unlike other forms of training, you need buy-in and participation on two levels. The first is to ensure people are willing to receive knowledge and training created by their peers. The second level is that you need those same people to create training materials (i.e. e-learning courses/modules) for others. Without both, knowledge sharing won’t work. Be open to all sources of knowledge, including lower-ranking members of the team. Make knowledge sharing part of the job description rather than being something additional. Make sure you facilitate knowledge sharing by ensuring employees have the time and resources to participate. Just making it another task in an employee’s already busy working calendar is unlikely to yield many benefits or achieve much success. Recognise the efforts of employees who actively participate in knowledge sharing, particularly those who create training assets. You could financially reward individuals, for example. 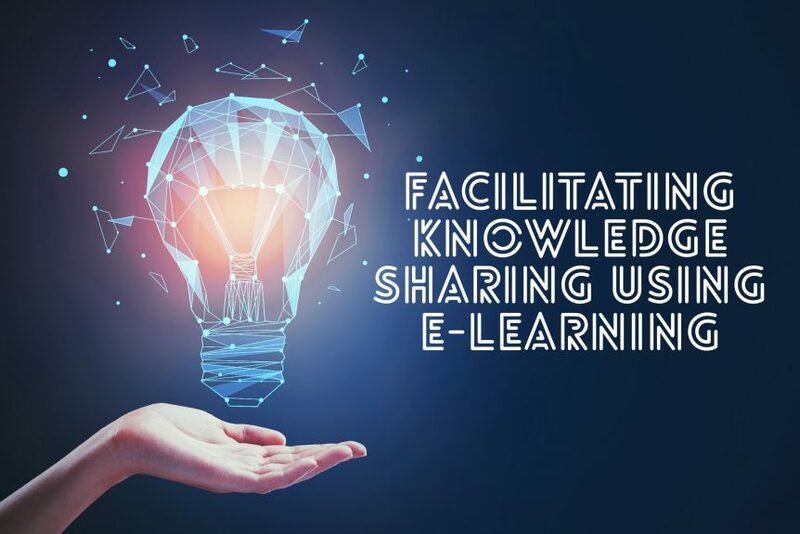 E-learning’s role in creating and nurturing a knowledge sharing culture involves making it all possible from a practical perspective. In other words, when an employee has knowledge to share, they create an e-learning course or module that then gets distributed to all relevant people. With the right e-learning developer in Dubai, setting this up is straightforward and cost-effective. Adopt a flexible training strategy– this involves creating a library of e-learning courses that employees can access whenever they need to. These courses can include centralised training materials created by the company, compulsory training courses, and knowledge sharing elements created by individual members of your team. Utilise e-learning best practices – you should also utilise technologies like the cloud and mobile learning as well as learning methodologies like microlearning. Storing your library of e-learning materials in the cloud enables employees to access what they need when they need from wherever they are in the world. Making the courses mobile-friendly lets them learn on their phone, plus microlearning techniques mean they don’t have to allocate large blocks of time to learning. Encourage collaboration and social learning – finally, add collaboration and social learning elements to your e-learning courses and e-learning course templates. Collaboration in e-learning is where people work on problems or scenarios in small groups as teams, while social learning means learning by observing others. So, for example, get knowledge sharing creators to use real-world examples, stories, and scenarios when creating course content. You will have to put in place the right structures for creating e-learning courses. When these are in place, e-learning is the best delivery vehicle for knowledge sharing in your organisation.